Process Explorer (procexp.exe) is a great free software and can usually replace the Task Manager but in Windows Vista the following error message comes up when this is done. No solution found so far. Please add a comment if you find a solution to this. Here's how it works in AutoCAD 2008. You can export your custom settings between systems running the same release of AutoCAD, or export the custom settings and later re-import them on the same computer if you need to reinstall AutoCAD. When exporting custom settings, a migration package is created that contains an XML file. This file contains custom settings, a listing of the custom files from local locations used with AutoCAD, and optionally, custom files in network locations. The migration package is a ZIP file archive, so it has the file extension ZIP. During the import process, you select the ZIP file archive that contains the exported custom settings you want to merge onto your computer. File types that are most commonly included in the migration package are: xml, lin, pat, pgp, pc3, pmp, ini, shx, mlm, ctb, stb, cui, mnl, fmp, cus, psf, bmp, atc and aws. If you get a crash of lmtools.exe (Macrovision's network license management application) when you try to access the system settings tab the solution is as follow. Add all exe files like lmgrd.exe, lmtools.exe, lmutil.exe and the vendor deamon for example adskflex.exe to the Data Execution Prevention exception list. Data Execution Prevention (DEP) helps prevent damage from viruses and other security threats that attack by running (executing) malicious code from memory locations that only Windows and other programs should use. DEP can take advantage of software and hardware support. Snipping Tool the Vista killer application or is it AutoCAD 2008? There are actually reasons to upgrade to Vista. Snipping Tool is not really a killer application but it is really a good one that is included with Vista. By the way. AutoCAD 2008 based applications are supported to run on Vista. For some it will be the killer application on Vista due to all the great 2D functionality added to it. Microsoft® Windows Vista™ Home Basic, Home Premium, Ultimate, Business, and Enterprise, Windows® XP Home and Professional SP2, Windows® 2000 SP4 can be used as operating systems to run AutoCAD 2008. You can use Snipping Tool that is found among the Accessories to capture a screen shot, or snip, of any object on your screen and then annotate, save, or share the image. There’s no hotkey so you have to right click on the icon and set a shortcut key for it. PrintScreen cannot be used though so use something else that is easy to remember F12 is close so try Ctrl+F12. After you capture a snip, it's automatically copied to the mark-up window, where you can annotate, save, or share the snip. This article contains a list of applications that have earned the "Certified for Windows Vista" logo or the "Works with Windows Vista" logo. These applications are officially supported on Windows Vista by our independent software vendor (ISV) partners. The complete list is here and is updated regularly. 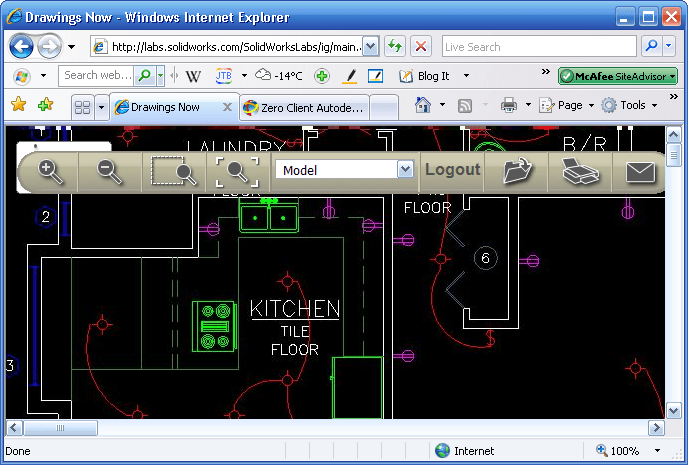 The CAD Manager Control Utility has been updated for AutoCAD 2008. It is also still backward compatible with AutoCAD 2007. The Search Results tab of InfoCenter can be configured to display content from various sources, such as the product Help system, CAD Manager Channels, or the Internet. You can specify whether users who install from the deployment can customize access to their InfoCenter search locations. The following file formats are supported: xml, doc, chm, html, htm, pdf and xml. This is a great way for the CAD Manager to add the CAD Manuals and other useful documents so they are easily accessed. The search locations are saved in the registry at this location. The CAD Managers dream has come true. Enable CAD Manager Channels. Controls the display of the CAD Manager Channels in InfoCenter. Aside from being able to toggle CAD Manager Channels, you can also define the CAD Manager feed location and set the display name for the CAD Manager Channel. Enable RSS Feeds. Users can subscribe to any number of RSS feeds. Each feed is contained within a discrete InfoCenter category. Additionally, you can specify whether users can add RSS feeds. Customer Involvement Program (CIP) is also a new thing. 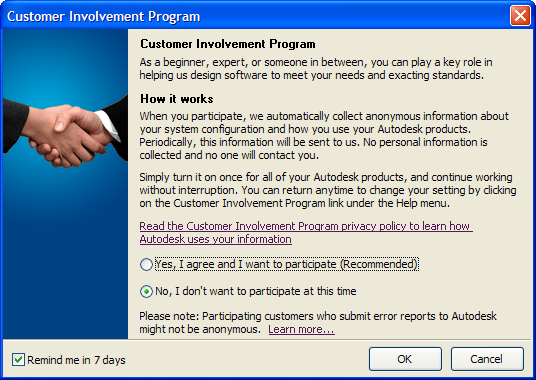 As CAD Manager you should consider if you want to allow your users to participate or not. A lot of data is sent to Autodesk's servers. Don't worry. My suggestion is that you do participate. Check out here what CIP is. 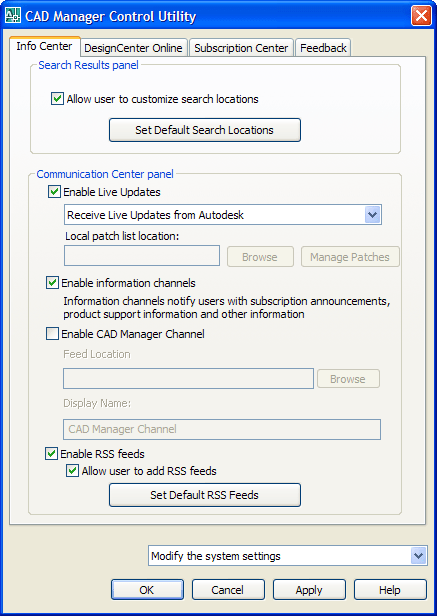 Something that is not possible with this utility is to edit the RSS feeds or add new ones as well as specify what AutoCAD Help files should be included in a search. If you want to hack some xml take a look at this file. Notice that you need to set the item id correct and follow the general syntax overall to have it working. Final release of Microsoft Virtual PC 2007 available for free. I've used Virtual PC 2007 to run for example Windows Vista Ultimate together with the latest AutoCAD 2008 and AutoCAD Architecture 2008 and confirmed that it works to run older versions of AutoCAD like AutoCAD 2007, AutoCAD 2006, AutoCAD 2005 and AutoCAD 2004 on Vista. Adobe Labs has released a new kind of feed reader or so called social newspaper as a technology preview. I took my OPML from RSS Bandit and gave myFeedz a try. It's pretty nice. 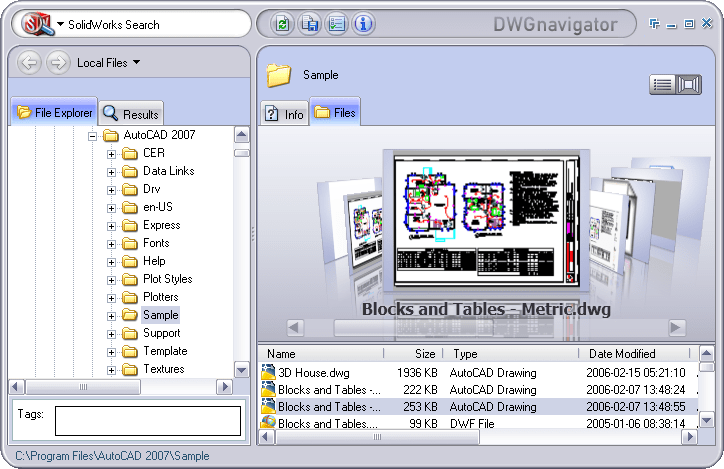 Give it a try and see what the news are about AutoCAD 2008 using myFeedz. Below I also tried some of the API to create a tag cloud as well as showing 5 new articles related to AutoCAD 2008.
myFeedz is a social newspaper because what people talk about matters. But people talk about too many things. myFeedz finds what's important from the sea of information out there and shows you what you need to read. It learns from what you like and helps you keep up with your interests. myFeedz is not an online RSS reader, although news are tracked via RSS feeds. myFeedz is not a search engine, although you can search articles by specific tags. myFeedz is not a bookmarking service, although you can submit feeds of your favorite websites. myFeedz shows the news that matter to the people, the most linked to and referenced news. It also learns from what users like to read and uses that information to better personalize the service for each of them. A RSS reader simply shows you articles from your feeds only, ordered by date. There's no relevance sorting or filtering, you get a lot of noise that makes it difficult to find out what's really interesting. myFeedz uses artificial intelligence techniques to show you personalized news about topics you are interested in. Some of the things used to create an article's importance are its source, tags, popularity, rating, language and more. Your profile (tags, feeds and reading history) is then also taken into account to determine how important that article is for you. All this complicated process helps you save time and keep up with the things you like. Trying the new pipes from Yahoo I aggregated all official Autodesk blogs that are about AutoCAD 2008. Here is the pipe and here is the RSS feed. One thing that does not seem to work is to filter the content of the blog posts so it is only those with AutoCAD 2008 in the title that shows up. I also cloned it to make a pipe and RSS feed in German as well as a pipe and RSS feed in French. But it seems like not all posts get translated. Il est officiel - AutoCAD 2008 est ici ! AutoCAD 2008 das ein youve, das!!! wartet! Not sure it make much sense since I don't understand either of the languages. But trying those automated language translators before I know it can be a lot of errors in the process. 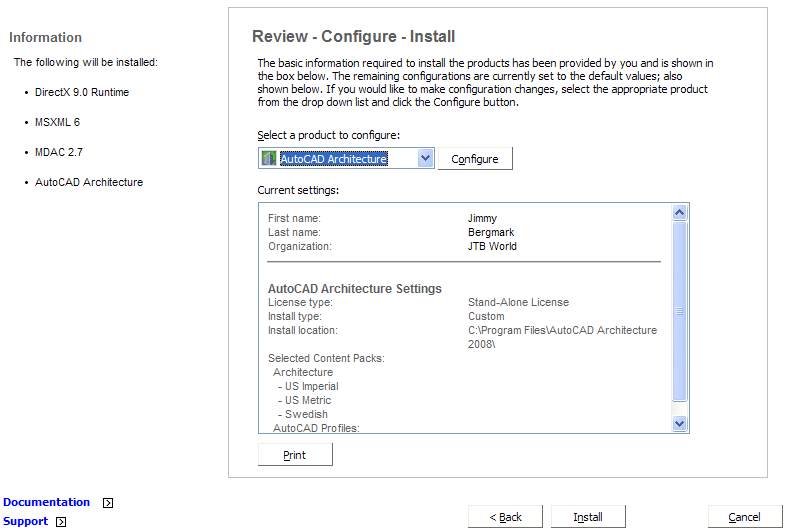 One of the first things to notice is when installing AutoCAD 2008 or for example AutoCAD Architecture 2008 (formerly known as Architectural Desktop or ADT and soon probably known as ACA 2008) is that the Installation Wizard has been updated. The help is easy available during the setup. 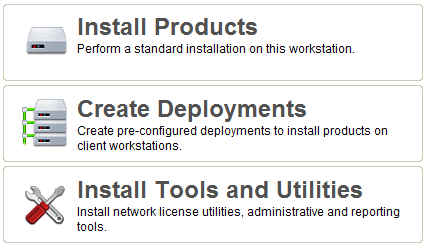 For example if you wonder "When performing a Typical installation, what gets installed?" or "What is the advantage to installing the Materials Library?" I like that you directly from the media can install using both license types Stand-alone license and Network license. No need to create a deployment if you don't want to. The deployment wizard is only possible to run from the media. Another nice thing is that you don't get a strange dialog box at the beginning telling you that some components needs to be installed without knowing what these components are. Now you directly see what will be installed prior to AutoCAD. 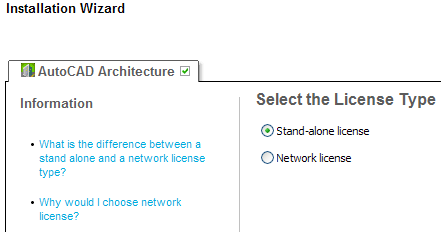 AutoCAD 2008 Network License Activation Utility has got a facelift but nothing new more than that from what I can see. Autodesk Product Manager has got it's AdpmProducts.bin updated but looks like before. Macrovision's SAMreport Lite has not been updated. It is v3.6 that is included. You might have seen the ads about Cadalyst Online PlanRoom. Cadalyst Online PlanRoom is a secure, Web-based project management system, featuring easy-to-use, time-saving tools to help you collaborate and streamline projects by centralizing plans, large-format drawings and specifications in one place. It says "Click Here to Register for a FREE Account". Looks like a great deal, but if you read the fine print in Terms & Conditions you will notice that it says "for trial purposes only." Q. What types of files can I upload and view? A. Image files such as TIFF and JPEG are the safest file types to use. Adobe PDF and Autodesk DWF formats are also supported but may take slightly longer to view. CAD files such as AutoCAD DWG and MicroStation DGN may also work, but are more complicated and can contain links to XREF (External Reference) files that will also need to be uploaded. Most PLT plot files also view, as do office documents such as Word, WordPerfect and Excel files. Notice the text I made bold. I don't necessarily agree with that unless you have very low quality of your image files. For good and bad Outlook 2007 uses the same HTML rendering engine as Word 2007 uses. In previous releases Outlook used the Internet Explorer rendering engine and since the Word engine is a bit different your emails in Outlook 2007 might show up different than before. Download Outlook 2007 Tool: HTML and CSS Validator. Individual files can be scanned on demand and Virustotal uses multiple antivirus engines to test the file. The file is tested with products form F-Secure, Grisoft, McAfee, Symantec among others. What antivirus product do you use and what are the pros and cons? I am beta testing Norton 360 from Symantec on one of my machines and so far it works pretty good. I post this for my own memory as with much else on this blog but it might as well be useful for you. Use the registry and change Type at this location. (change the x depending on version and vertical/flavor. For example AutoCAD 2007 is R17.0\ACAD-5001:409). Using the registry hack with AutoCAD 2009 and later the cascading licensing service doesn’t install, so cascading will not work when converted from SLM to NLM. If you install network version and convert to SLM then PLU doesn’t install and user will not be able to transfer his license. I have run into situations several times using Visual Studio 2005 and VB.NET when it's not possible to catch an error using try and catch. The solution has been to use the old on error goto or on error resume next. Thanks for the latest version Steve. I've been able to run AutoCAD 2007 as well as most other software's I need on Windows Vista without problems. There are some things needed to have it working and it might be some things I have not tried that does not work for you. If you just try to start AutoCAD Microsoft warns about "minor compatibility issues" but I have not found them so far. Running as Administrator solves a lot of compatibility problems with applications and that is the same with ADT 2007. Autodesk will be announcing official details on Microsoft Windows Vista support for AutoCAD and AutoCAD LT in the next 2-4 weeks according to Shaan. So you might want to wait until then. Run the installation as Administrator. Run also the application as Administrator. Right click to do that or change the properties to have it run as Administrator. It is also possible to run a program in compatibility mode for Windows XP (Service Pack 2). You can also turn off User Account Control (UAC). What is your trick to get applications running on Windows Vista? Update. 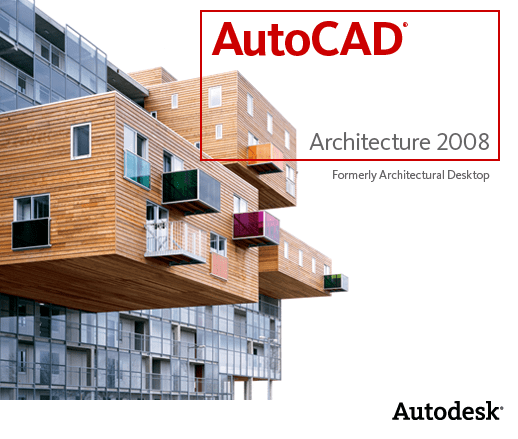 Autodesk will release an update for AutoCAD 2007 and AutoCAD LT 2007. I've stopped adding Technorati tags. I have thought about it a time and after reading Are Technorati Tags Useless? I stopped adding them. Are you missing them? Owen Wengerd has contributed to the open source project ObjectDCL so AutoCAD 2007 is supported. I wonder if this is true though. "ObjectDCL has been sold" it says. I guess you have not missed this but it is worth mentioning anyway. 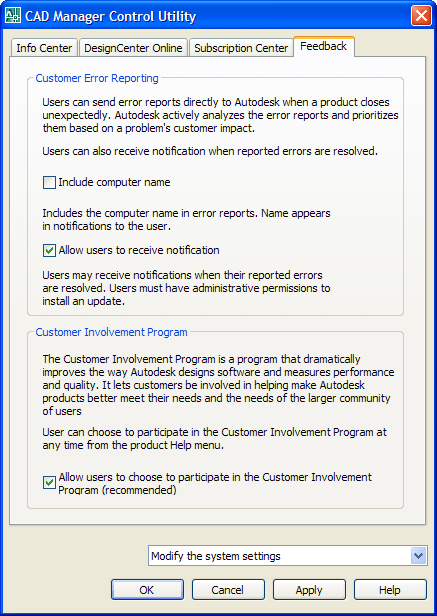 Autodesk Design Review is available FREE-of-charge. With Design Review you can markup, review, batch print and a lot more. Download your copy now. This will surely make DWF usage more wide spread. Microsoft has a program running on your computer called the Volume Shadow Copy Service or VSS. VSS is the best option out there for backing up open and locked files. When we chose to use VSS, it was fully supported by Microsoft. Recently, Microsoft has made the decision to stop supporting VSS in Windows XP. It is apparently fixed and supported in Windows Vista, which will be released in January of next year, and in Windows Server 2003. Why is it still showing "Open/locked file support" on your website when it does not work? It does, for 99% of our users. Unfortunately, the remainder of our users have trouble. We're continuing to work on a fix, but again, this is Microsoft's software and they have declared an end to Windows XP's support cycle with regards to VSS. This being the case, I would again recommend upgrading to Vista when you have the chance. Do you have this problem too? Do you have a solution for the VSS problem?